Like Robin, I’ve decided to have an epic project to work on. While at Vogue Knitting Live! I decided to purchase the starter kit for the Great American Aran Afghan project from Hunt Valley Cashmere. I went with the 8-ply version (worsted) and have started the first square listed for the project by Barbara Selesnick. I’m going to get new yarn every other month…I hope this gives me enough time to get each square done. Is this hopeful thinking?! 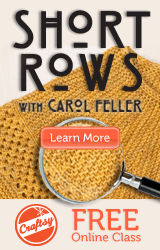 Since I’m only into row 8 of the first repeat on this square, I have a feeling I’ll be stock piling cashmere yarn. But I think if I stay on it and you guys keep me honest, I’ll be ok….no?